Color photos of the American Association Brewers are awfully hard to come by. The best sources are the Milwaukee newspapers and their Sunday color supplements. 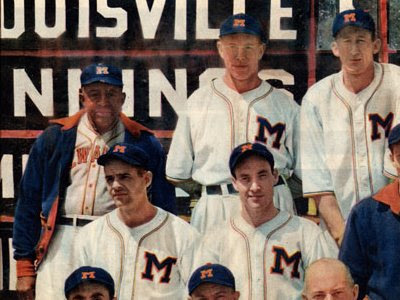 Top row, left to right: trainer Doc Buckner, Allan Johnson (p), Ted Gulic (of), Rudy York (1b), Herman "Hi" Bell (p), Lin Storti (3b) and assistant secretary Rudy Shaffer. Third row: Jack Kloza (of), Clyde Hatter (p), Luke Hamlin (p), Garland Braxton (p), coach Red Smith and Forrest Pressnell (p). Second row: George Detore (c), Chet Laabs (if), team president Henry Beadinger, manager Al Sothoron, team secretary Lou Nahim, Chet Morgan (rf) and Salvadore Hernandez (utility). 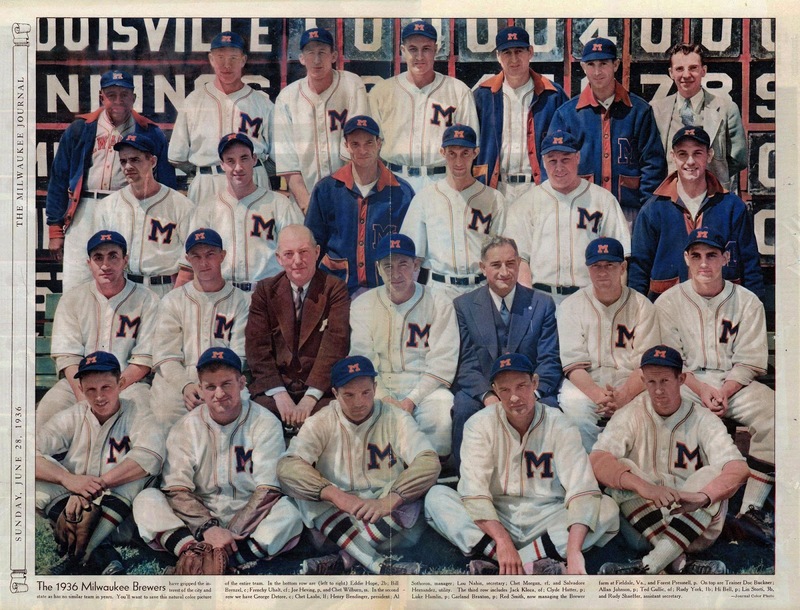 Front row: Eddie Hope (2b), Bill Brenzel (c), Bernard "Frenchy" Uhalt (cf), Joe Heving (p) and Chet Wilburn (ss). There's so much to love about this picture. The caption mentions that coach Red Smith (himself the subject of an earlier post) is "now managing the Brewer farm at Fieldale, Va." A reminder that as strange as it may seem to us now, larger independent clubs such as the Brewers had their own farm system. How very cool are those? I also love the double-piping, red and blue. And white socks? Somehow, they work with this uniform (now, if only a certain misnamed squad in Chicago would take notice). And finally, you can see that Doc Buckner is wearing a familiar road jersey. 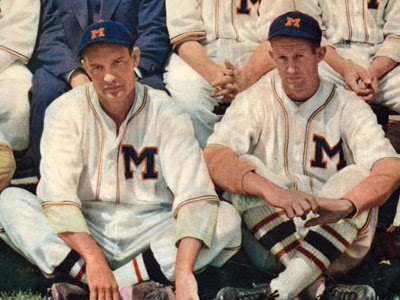 The 1936 Brewers would finish the season 90-64, 5 games ahead of second-place St. Paul. It was the Brews' first pennant since 1914, and third overall. This was also the first year that the American Association held a postseason playoff, with the winner representing the league in the Junior World Series. Known until 1932 as the "Little World Series", this annual match-up was founded in 1904, one year after the "other" World Series. was played between representatives of the AA and the International League. The playoffs were the brainchild of Francis Joseph "Shag" Shaughnessy, president of the IL. In what would become known as the Shaughnessy Playoffs, the top four clubs in each league would face off in two rounds of best-of-seven postseason play, with the top finishing club playing its initial series against the third-place team and the season runners-up playing the fourth-place team. The winners of each series would play each other and the champion of that second round would advance to the Junior World Series as the AA's representative. The International League was, naturally, the first to adopt the Shaughnessy Playoffs in 1933. Other leagues would follow, including the Texas League (1933) and Southern Association (1935). 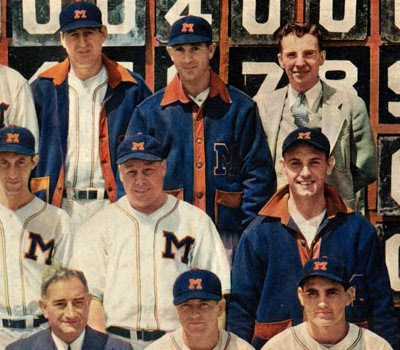 For the 1936 season, it was adopted by the Pacific Coast League and the American Association. In this inaugral playoff, the Brewers first faced the Kansas City Blues, defeating them in four straight games, while the second-place St. Paul Saints fell to the fourth-place Indianapolis Indians in five. The Brewers then defeated Indianapolis in five games in the second round. Over on the International League side, the Buffalo Bisons emerged to face Milwaukee. The Brews took the series, 4 games to 1, to win their first Junior World Series and cap off a championship season. Holy cow, Chance! What a find!